Bethlehem (Arabic: بيت لحم‎‎ Bayt Laḥm (help·info)[needs IPA]; "House of Meat", Bēt Laḥm; Hebrew: בֵּית לֶחֶם Bēṯ Leḥem, Modern: Bet Leḥem [bet ˈleχem], lit. "House of Bread"; Ancient Greek: Βηθλεέμ [bɛːtʰle.ém]; Latin: Bethleem) is a Palestinian city located in the central West Bank, Palestine, about 10 kilometers south of Jerusalem. Its population is approximately 25,000 people. It is the capital of the Bethlehem Governorate. The economy is primarily tourist-driven. Bethlehem became part of Jund Filastin following the Muslim conquest in 637. Muslim rule continued in Bethlehem until its conquest in 1099 by a crusading army, who replaced the town's Greek Orthodox clergy with a Latin one. In the mid-13th century, the Mamluks demolished the city's walls, which were subsequently rebuilt in the early 16th century, after Bethlehem became part of the Ottoman Empire. Control of Bethlehem passed from the Ottomans to the British at the end of World War I. Bethlehem came under Jordanian rule during the 1948 Arab-Israeli War and was later captured by Israel in the 1967 Six-Day War. Since the 1995 Oslo Accords, Bethlehem has been administered by the Palestinian Authority. Bethlehem now has a Muslim majority, but is still home to a significant Palestinian Christian community. Bethlehem's chief economic sector is tourism, which peaks during the Christmas season when Christians make pilgrimage to the Church of the Nativity, as they have done for almost 2,000 years. Bethlehem has over thirty hotels and three hundred handicraft workshops. Rachel's Tomb, an important Jewish holy site, is located at the northern entrance of Bethlehem. The earliest reference to Bethlehem appears in the Amarna correspondence (c. 1400 BCE). In one of his six letters to Pharaoh, Abdi-Heba, Egypt's governor for Jerusalem, appeals for aid in retaking "Bit-Lahmi" in the wake of disturbances by Apiru mercenaries. employed by his rivals: "now even a town near Jerusalem, Bit-Lahmi by name, a village which once belonged to the king, has fallen to the enemy . . . Let the king hear the words of your servant Abdi-Heba, and send archers to restore the imperial lands of the king!" Archaeological confirmation of Bethlehem as an Israelite city was uncovered in 2012 at the archaeological dig at the City of David in the form of a bulla (seal impression in dried clay) in ancient Hebrew script that reads "From the town of Bethlehem to the King," indicating that it was used to seal the string closing a shipment of grain, wine, or other goods sent as a tax payment in the 8th or 7th century BCE. In 326-328, the empress Helena, consort of the emperor Constantius Chlorus, and mother of the emperor Constantine the Great, made a pilgrimage to Syra-Palaestina, in the course of which she visited the ruins of Bethlehem. The empress promoted the rebuilding of the city, and Eusebius of Caesarea writes that she was responsible for the construction of the Church of the Nativity. In 1187, Saladin, the Sultan of Egypt and Syria who led the Muslim Ayyubids, captured Bethlehem from the Crusaders. The Latin clerics were forced to leave, allowing the Greek Orthodox clergy to return. Saladin agreed to the return of two Latin priests and two deacons in 1192. However, Bethlehem suffered from the loss of the pilgrim trade, as there was a sharp decrease of European pilgrims. William IV, Count of Nevers had promised the Christian bishops of Bethlehem that if Bethlehem should fall under Muslim control, he would welcome them in the small town of Clamecy in present-day Burgundy, France. As such, The Bishop of Bethlehem duly took up residence in the hospital of Panthenor, Clamecy, in 1223. Clamecy remained the continuous 'in partibus infidelium' seat of the Bishopric of Bethlehem for almost 600 years, until the French Revolution in 1789. Bethlehem — along with Jerusalem, Nazareth, and Sidon — was briefly ceded to the Crusader Kingdom of Jerusalem by a treaty between Holy Roman Emperor Frederick II and Ayyubid Sultan al-Kamil in 1229, in return for a ten-year truce between the Ayyubids and the Crusaders. The treaty expired in 1239, and Bethlehem was recaptured by the Muslims in 1244. In 1250, with the coming to power of the Mamluks under Rukn al-Din Baibars, tolerance of Christianity declined. Members of the clergy left the city, and in 1263 the town walls were demolished. The Latin clergy returned to Bethlehem the following century, establishing themselves in the monastery adjoining the Basilica of the Nativity. The Greek Orthodox were given control of the basilica and shared control of the Milk Grotto with the Latins and the Armenians. On December 21, 1995, Israeli troops withdrew from Bethlehem, and three days later the city came under the complete administration and military control of the Palestinian National Authority in conformance with the Interim Agreement on the West Bank and the Gaza Strip in 1995. Prior to Palestinian control of Bethlehem, there were 20,000 Christians living in the city. Today, 20 years after Palestinians gained control there are only 7,500 Christians living in the city. During the Second Palestinian Intifada in 2000–2005, Bethlehem's infrastructure and tourism industry were damaged. In 2002, it was a primary combat zone in Operation Defensive Shield, a major military counteroffensive by the Israeli Defense Forces (IDF). During the counteroffensive, the IDF besieged the Church of the Nativity, where dozens of Palestinian militants had sought refuge. The siege lasted for 39 days. Several militants were killed. It ended with an agreement to exile thirteen of the wanted militants to various foreign countries. According to Ottoman tax records, Christians made up roughly 60% of the population in the early 16th century, while the Christian and Muslim population became equal by the mid-16th century. However, there were no Muslim inhabitants counted by the end of the century, with a recorded population of 287 adult male tax-payers. Christians, like all non-Muslims throughout the Ottoman Empire, were required to pay the jizya tax. In 1867 an American visitor describes the town as having a population of 3,000 to 4,000; of whom about 100 were Protestants, 300 were Muslims and "the remainder belonging to the Latin and Greek Churches with a few Armenians." Another report from the same year puts the Christian population at 3,000, with an additional 50 Muslims. An 1885 source put the population at approximately 6000 of "principally Christians, Latins and Greeks" with no Jewish inhabitants. In the PCBS's 1997 census, the city had a population of 21,670, including a total of 6,570 refugees, accounting for 30.3% of the city's population. In 1997, the age distribution of Bethlehem's inhabitants was 27.4% under the age of 10, 20% from 10 to 19, 17.3% from 20-29, 17.7% from 30 to 44, 12.1% from 45-64 and 5.3% above the age of 65. There were 11,079 males and 10,594 females. According to a PCBS estimate, Bethlehem's population was 29,930 in mid-2006. 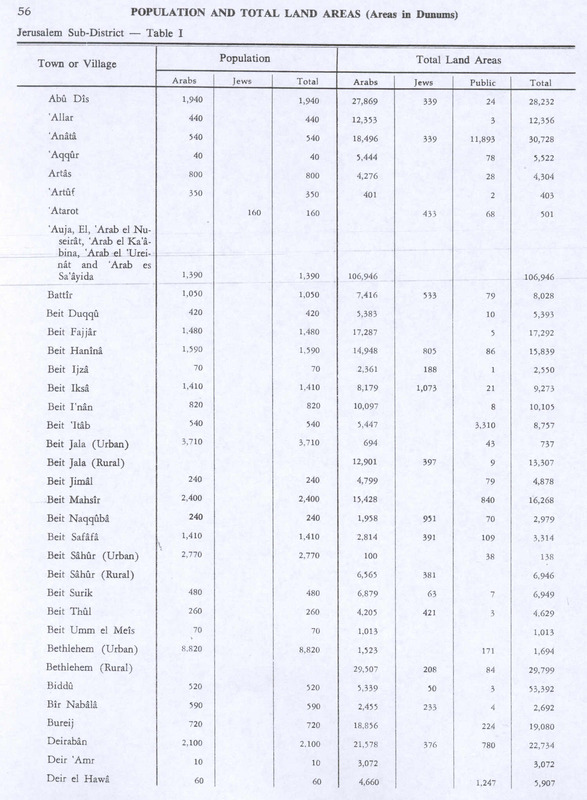 The 2007 PCBS census, however, revealed a population of 25,266, of which 12,753 were males and 12,513 were females. There were 6,709 housing units, of which 5,211 were households. The average household consisted of 4.8 family members. Early Christian traditions describe Jesus as being born in Bethlehem: in one, a verse in the Book of Micah is interpreted as a prophecy that the Messiah would be born there. The New Testament has two accounts of the birth. In the Gospel of Luke, Jesus' parents live in Nazareth and travel for the Census of Quirinius to Bethlehem, where Jesus is born, after which they return home. The Gospel of Matthew version mentions Bethlehem but not the census. Told that a 'King of the Jews' has been born in the town, Herod orders the killing of all the boys aged two and under in the town and surrounding area. Joseph, warned of this in a dream, flees to Egypt with his family and later settle in Nazareth. Some modern scholars question the idea that Jesus was born in Bethlehem, arguing that the biblical stories are not historical accounts but as symbolic narratives invented to present the birth as fulfillment of prophecy and imply a connection to the lineage of King David. The Gospel of Mark and the Gospel of John do not include a nativity narrative, but refer to him only as being from Nazareth. In a 2005 article in Archaeology magazine, archaeologist Aviram Oshri points to an absence of evidence for the settlement of Bethlehem near Jerusalem at the time when Jesus was born, and postulates that Jesus was born in Bethlehem of Galilee. In a 2011 article in Biblical Archaeology Review magazine, Jerome Murphy-O'Connor argues for the traditional position that Jesus was born in Bethlehem near Jerusalem. The Israeli construction of the West Bank barrier has had an impact on Bethlehem politically, socially, and economically. The barrier is located along the northern side of the town's built-up area, within meters of houses in 'Aida refugee camp on one side, and the Jerusalem municipality on the other. Most entrances and exits from the Bethlehem agglomeration to the rest of the West Bank are currently subjected to Israeli checkpoints and roadblocks. The level of access varies based on Israeli security directives. Travel for Bethlehem's Palestinian residents from the West Bank into Jerusalem is regulated by a permit-system. Palestinians require a permit to enter the Jewish holy site of Rachel's Tomb. Israeli citizens are barred from entering Bethlehem and the nearby biblical Solomon's Pools. ↑ Giuseppe Ricciotti, Vita di Gesù Cristo, Tipografia Poliglotta Vaticana (1948) p. 276 n.
↑ le Strange, 1890, pp. 298–300. ↑ de Sivry, L: "Dictionnaire de Geographie Ecclesiastique", p. 375., 1852 ed, from ecclesiastical record of letters between the Bishops of Bethlehem 'in partibus' to the bishops of Auxerre. ↑ Paul Reed, 2000, p. 206. ↑ W. M. Thomson, p. 647. ↑ About Bethlehem at the Wayback Machine (archived November 13, 2007) The Centre for Cultural Heritage Preservation via Bethlehem.ps. ↑ Distance from Bethlehem to Tel Aviv, Distance from Bethlehem to Gaza Time and Date AS / Steffen Thorsen. ↑ Detailed map of the West Bank. ↑ 60.0 60.1 Ellen Clare Miller, 'Eastern Sketches - notes of scenery, schools and tent life in Syria and Palestine'. Edinburgh: William Oliphant and Company. 1871. p. 148. ↑ Crossan and Watts, p. 19. ↑ Dunn, 2003, pp. 344–345. ↑ Marcus J. Borg, Meeting Jesus for the First Time (Harper San Francisco, 1995) page 22–23. ↑ Aviram Oshri, "Where was Jesus Born? ", Archaeology, Volume 58 Number 6, November/December 2005. ↑ Jerome Murphy-O'Connor, Bethlehem ... Of Course, Biblical Archaeology Review. Archived October 28, 2013 at the Wayback Machine; see also A. Puig i Tàrrech, ″The Birth of Jesus and History: The Interweaving of the Infancy Naratives in Matthew and Luke″, B. Estrada, E. Manicardi, A. Puig i Tàrrech (ed. ), ≤The Gospels, History and Christology. The Search of Joseph Ratzinger≥, Vatican City:LEV, 2013, 353-97. ↑ Taylor, 1993, pp. 99–100. "Joseph ... took up his quarters in a certain cave near the village; and while they were there Mary brought forth the Christ and placed him in a manger, and here the Magi who came from Arabia found him. "(Justin Martyr, Dialogue with Trypho, chapter LXXVIII). ↑ In Bethlehem the cave is pointed out where he was born, and the manger in the cave where he was wrapped in swaddling clothes. And the rumor is in those places, and among foreigners of the Faith, that indeed Jesus was born in this cave who is worshipped and reverenced by the Christians. (Origen, Contra Celsum, book I, chapter LI). ↑ Taylor, 1993, pp. 96–104. ↑ "Bethlehem Public Transport System". Archived from the original on 2007-12-27. Retrieved 2008-01-22. <templatestyles src="Module:Citation/CS1/styles.css"></templatestyles> Bethlehem Municipality. ↑ The City of Bethlehem has signed a twinning agreements with the following cities at the Wayback Machine (archived December 28, 2007) Bethlehem Municipality.